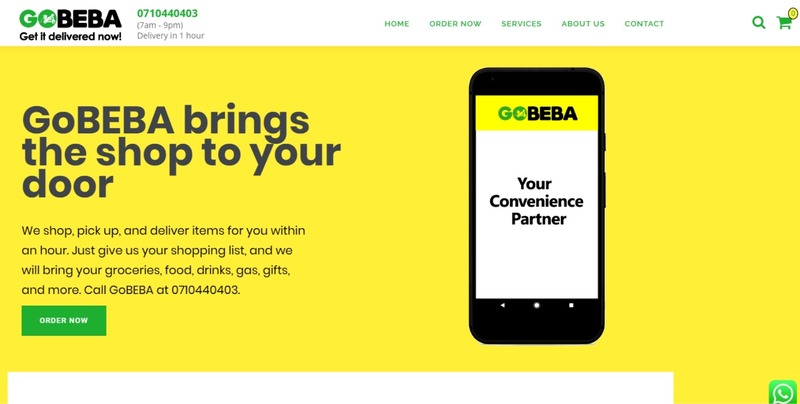 GoBEBA, an on-demand e-commerce logistics platform built by former OLX and Amazon executives, has gone live in Kenya. This step is a move to disrupt the hyper-local on-demand logistics market in Kenya, to compete against the likes of Glovo, Sendy, SafeBoda, UberBoda, TaxifyBoda, BusyBoda and GetBoda among others. It was launched by Peter Ndiang’u, a former OLX Country Manager and Lesley Mbogo, an ex-Amazon Head of Product. GoBEBA will allow customers shop directly from local merchants and have their goods delivered to them in less than one hour. It gets your shopping delivered at home, gets your favorite beverages to you instantly and helps small businesses in far places get their supplies conveniently. It will also help distribute goods to micro-retailers in small urban centers across the country. Mr. Ndiang’u, the former OLX Country Manager said that Africa’s growing young population and growing middle class presents a huge opportunity for e-commerce and logistics companies but for logistics to gain widespread consumer adoption, the approach needs to be localized better than the current global players in the market. “Urban consumers face a growing challenge of highly trafficked and crowded cities in a highly fragmented retail environment, making it difficult to access goods conveniently. With GoBEBA’s entry into the Kenyan market, we seek to address this challenge through technology by helping consumers discover and access goods from local retailers and artisans in a highly convenient way. Furthermore, GoBEBA will enable small retailers and businesses to distribute goods in urban and peri-urban centers across the country, ” said Mr. Ndiang’ui. In Sub-Saharan Africa, consumption of goods is rising fast and is estimated to reach Ksh 200 trillion by 2025, as incomes grow and more people move into urban centers. GoBEBA aims to provide consumers and small businesses with multiple services ranging from groceries, gas, parcels, food, and drinks. It allows users to send a shopping list of items they would like to purchase; customers who do not own smartphones can place orders by calling or sending an SMS directly through the platform. GoBEBA Pros are experts that will find and shop the items on behalf of the customers and deliver in less than an hour. “Our objective is to drive consumers and micro-retailers demand through our e-commerce platform which consequently will drive demand for our logistics providers in the Kenyan market,” said Ms. Mbogo, the former Product Head at Amazon. GoBEBA plans to expand to other African countries such as Nigeria, Egypt, South Africa, Ethiopia, Ghana and Ivory Coast over the next five years.